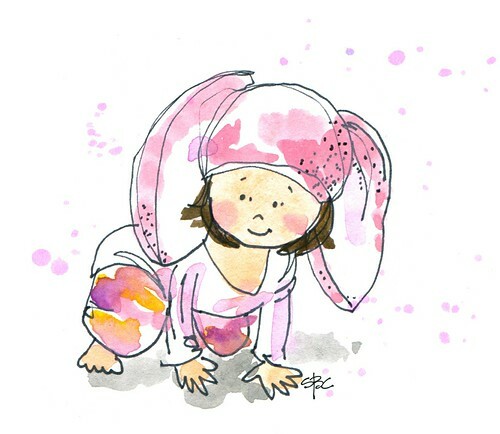 Another baby, or perhaps more accurately, a baby bunny; this one, inspired by one of the sweet models at BabaMoon. I can't do enough of these playful portraits these days. Do you know a cutie who deserves their own watercolor painting? Send me a note at suzanne [at] anopensketchbook [dot] com for details! Un dessin vraiment adorable... de quoi craquer ! What a fabulous idea. When I've recovered from this cold and the 1st birthday party I will have to email you to find out more about it! Thank you all for your comments! Melissa--indeed, it is!